"...we would like to inform you restarting the production of conversion sets for RC tank models at 1:16 scale. They will be brand new sets, our original production under the brand name „Profiline“ has a new owner in Germany. The new kits will therefore be produced under my name Stransky. 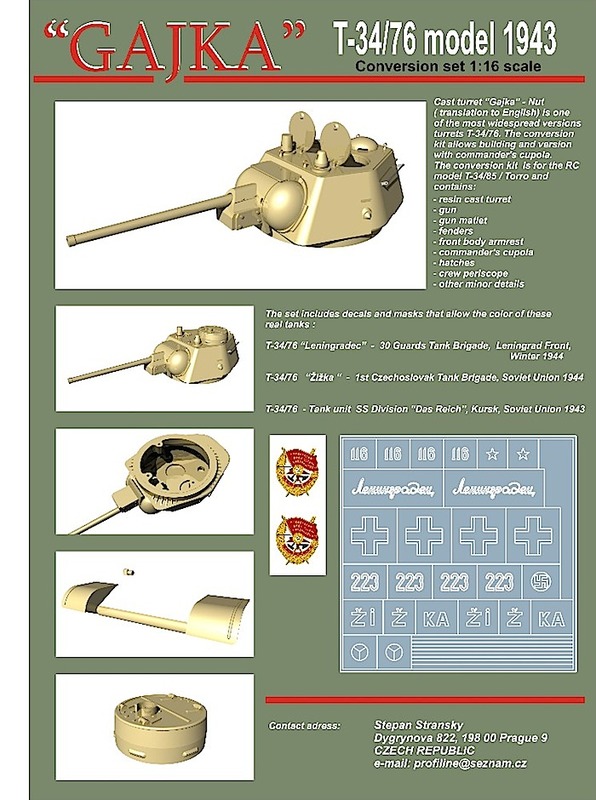 The first novelty is the tank turret „Gajka“ on the T-34/76 tank. Other upcoming sets will be, soviet self-propelled gun SU-85 based T-34/85, Soviet heavy tank KV-1s "Skorostnyj" or american M4 Sherman with a composite hull. Sets are made of high quality resin and carefully processed. They also include masks and decals for color application." 2) Новые наборы под именем "СТРАНСКИ"
4) В ближайшем будущем наборы для: СУ85 на базе Т-34/85; КВ-1С или американского М4 с литой ванной. Набор для Т-34/76 - башня "Гайка". вопрос еще цены сего чуда так как гайку у нас отливает Галиот и весьма давно уже. Но новость хорошая!